the word, CELEBREX. I was surprised when I came across this paperback in a secondhand shop, considering all the negative press Cox-2 inhibitors have gotten over the years. A good example of the negative press is this 2005 CNN article: “Could Celebrex survive a black box?” and more information than you want to know about the drug at the FDA website where mention is made that the FDA did eventually require a black box warning. The drug maker said it would stop advertising Celebrex. That was 2004. Yet, here is a report in 2006 where the New York Times tells us they began advertising again: Celebrex Ads Are Back, Dire Warnings and All . At the time I composed this page in November of 2011, I found only 2 reviews at Amazon for this odd book, published back in 1999. You can read them here. They are not flattering. 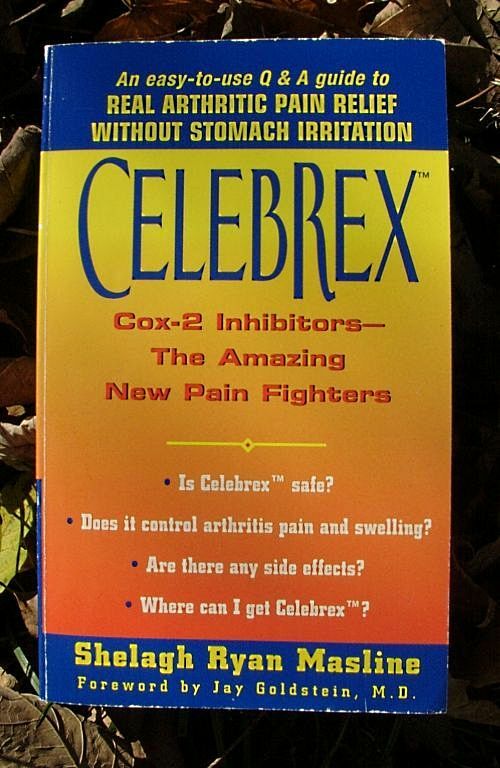 Interestingly, although the word, Celebrex, dominates the cover, and even though the word, Celebrex, is printed at the top of every other page throughout, most of the contents is actually NOT about Celebrex. That’s why I keep using the word, odd. If you bought this book on the spur of the moment, assuming you were getting a 280 page examination of Celebrex, you would be disappointed. ( If you check the chapter titles, you discover the word, Celebrex, is nowhere to be found, although the index at the back indicates it in the text of 46 pages, ) I can only wonder about the motives of anyone involved in bringing this volume to market, and why an editor would have allowed the word, Celebrex, to play such a prominent role on the cover, since it’s not the major topic in the text. Of course I have my suspicions. Yet, I guess a publisher has a right to put any words he wants on a cover if the words will sell more books. Incidentally, the drug came to market in 1999, the same year the book came out. If I were collecting book covers that appeared to be drug advertisements, this would be one of them. COX2 inhibitors, Pfizer’s Celebrex and Merck’s Vioxx. " "Doctor Faked Research on Drug That Killed Thousands: Gets Only Six Months"
Read more about Dr. Reuben's fraudulent pain management studies here. You might find it interesting to do a search for Celebrex on ClinicalTrials.gov and count how many research studies are completed but have posted NO RESULTS. Examine the few results that ARE posted and try to make sense of them. Then ask yourself: Why would an agency, if it were interested in protecting the public from dangerous medication side effects, NOT post clear, easy to understand warnings? Now take a look at the severe warning posted at the National Institutes of Health website for Celebrex (Celecoxib ). Among other things, that warning begins like this: "People who take nonsteroidal anti-inflammatory drugs (NSAIDs) (other than aspirin) such as celecoxib may have a higher risk of having a heart attack or a stroke than people who do not take these medications. These events may happen without warning and may cause death..."
saying it made over 4 billion dollars since it was first marketed in 1999. What would you think of your own parents if they told you they saw no problem with continuing to market this drug and take people’s money? Dr. John Abramson tells about the deception involving Celebrex in his excellent book: Overdosed America: The Broken Promise of American Medicine. This book should be read by everyone who ever goes to a doctor. Pain Relief without medications -- Do you know about this?